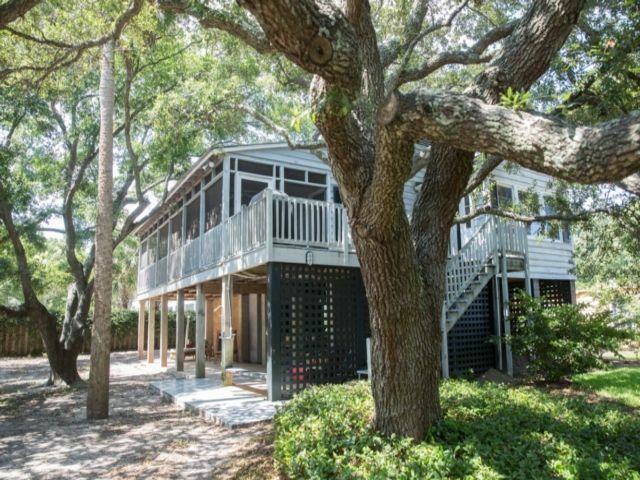 3 BR, 2 BA Charming Elevated House -- 1 Block to Beach! Large Screened Porch with Hammock! Sunday to Sunday Rental Only during Summer! Charming, Elevated Beach House just one short block away from beach access! House features an Eat-in Kitchen, LR/DR Combo, Large Screened-In Porch w/Hammock, 2 Flat Screen TVs, VCR, DVD Player, W/D and Full Bath (Below the House, please note this bathroom is underneath the house and must walk outside to access it), Gas Grill, CD Player, Outdoor Beach Shower, and Wireless Internet. Please note that this is an older beach home and there are no modern upgrades. Bed Sizes: 2Q, 2 extra-long Singles - Linens are provided. When you book this property it also includes a $250 credit to order beach gear!! There are many options including bicycles, beach chairs, umbrellas, kayaks, paddleboards, etc.! Our partnered company, VayK Gear, will contact you 45 days prior to your arrival so you can place your order and they will deliver all equipment to your rental home. Just another added bonus for booking through Carroll Realty to enhance your vacation experience. ALL BED LINENS, KITCHEN TOWELS, AND BATH TOWEL SETS ARE PROVIDED FOR YOUR CONVENIENCE!! You will only need to bring or plan to rent beach towels, chairs, bikes, umbrellas, etc. Also included is a starter set of toiletries such as toilet paper, bath / dish soaps, paper towels, etc. but please do keep in mind you may need to purchase these items after you arrive. This house also does a winter rental from October through March! Please contact us if you are interested! This unit has 2 bathrooms. 3 BR, 2 BA. Charming, Elevated Beach House just one short block away from beach access! House features an Eat-in Kitchen, LR/DR Combo, Large Screened Porch w/Hammock, New 32" Flat Screen TV, DVD, W/D (Below House), Gas Grill, CD Player, Outdoor Beach Shower, and Wireless Internet. Bed Sizes: 2Q, 2S - Linens are provided! Clean and close to the beach/ two musts! Loved the house and the location. However was very disappointed that the washer didn’t work bc it was filled with rocks and sand and that the coffee maker was filled with mold. If those 2 things could be fixed it would have been a perfect rental. This house is set back from the road with ample tree coverage that provides a lot of privacy. It is also a very short walk to the beach. The house was clean and beds were comfortable. Overall, we very much enjoyed our stay. The cottage was very cozy and inviting. Very disappointed though. The air conditioning didnt not cool off so it was hot during the day. For 2 days the alarm went on and off consistently during the day and night. My son called the police finally. They had it stopped but then it stsrted up again until someone came out to fix it. Stopped by Carroll Realty and told them (besides calling). The man i spoke to didnt give me warm fuzzies. The area is beautiful . We needed to have a quiet relaxing vacation. Really enjoyed the easy access to the beach! Overall, the house is in good shape, but the cloth furniture and bed spreads could use a thorough/deep cleaning. We did not use the bathroom downstairs. However, I purchased some bleach and removed the mold from the shower curtain liner in the bath upstairs. I would use this home again, since it was in our budget. Thanks. Rates are subject to change until reservation is confirmed with a Carroll Realty employee. 50% payment is due within 5 days of making your reservation. Final balance is due 30 days prior to arrival date. We accept Visa, Master Card, or Discover or personal check if more than 30 days from arrival. All reservations are charged a non-refundable $65 damage waiver which covers accidental damages up to $1000. Cleaning Fee is waived when staying 7 nights or more. We book weekly only during the summer months from Saturday to Saturday. 3 night minimum any other time. Damage waiver is non-refundable. No exceptions. Cancellations: After you have made payment, you will receive a refund minus a $50 fee only if the property is re-rented for the same time and price. We also offer travel insurance. There are 2 different plans: one is the traditional All Seasons Plan for an additional 7% or we also offer the Cancel For Any Reason plan for an additional 10%. The cancel for any reason plan must be purchased within 10 days of making the reservation. The other plan can be purchased any time prior to 30 days before your arrival. Please note: Travel Insurance should be booked and paid for through Carroll Realty, or through a link we can provide to you after booking.